We have our four iPad winners and our grand prize Apple Watch winner. Winners will be contacted directly by WEMU staff on instructions for receiving the devices. Our Spring Pledge Drive continues today! Your donations go directly to sustain this station. 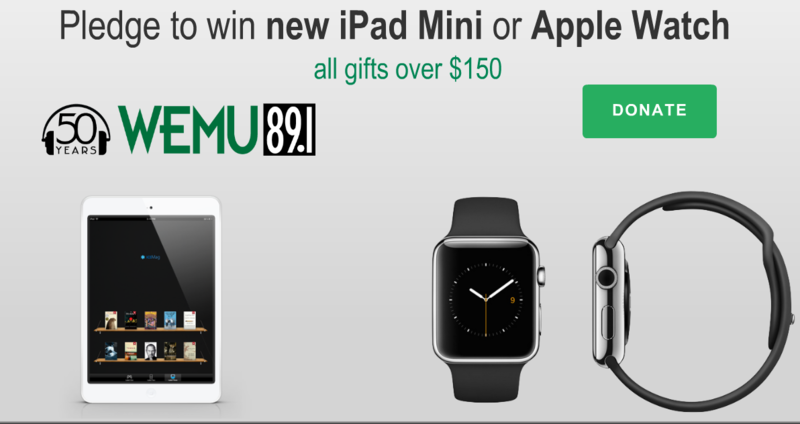 WEMU is giving away an iPad during every program today! And, one grand prize winner will win an Apple Watch. Anyone donating $150 or more during the Spring Drive will be entered for a chance to win, plus entrance for two to our Blues BBQ. Plus, every gift of $150 of more gets you entrance to the Blues BBQ featuring Madcat's Midnight Journey!